A complete grammar text for the youngest student, First Language Lessons for the Well-Trained Mind, Level 1 uses copywork, narration, picture study, and other classical techniques to develop the student’s language ability. Level 1 has the same great content as the original edition, along with new picture narration lessons. It has been redesigned for clarity and ease of use. Lessons follow the same order as the original edition. 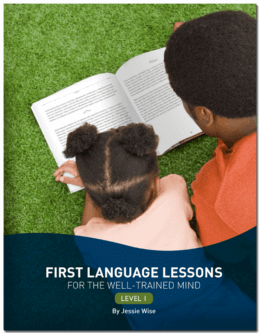 Originally published along with the second level of First Language Lessons as a single volume, Level 1 has been redesigned as a simple-to-use one-year program. Do you want a little more information about getting started with our Grammar programs? Check here. Is there an instructor’s guide to go with this level 1 book? No. This book contains everything you need to teach Level 1. It is self-contained. We are really enjoying this series and using it along with Writing with Ease. My oldest in currently in Level 3. We will probably use “Sentence Composing” before going on to Writing with Skill, but I assume those focus mostly on composition and not grammar. Do you have suggestions for a grammar program to follow FLL level 4? Thank you. Yes! You should check out our new grammar series “Grammar for the Well-Trained Mind.” It is designed to be used by students who have completed First Language Lessons 1-4 or a similar grammar curriculum. Is it possible to go thru this grammar program with 2 children together who are 2 years apart? If so, how would you recommend doing that? I have gone thru the program with 2 older children separately, but would like your thoughts on combining children. Thank you! That would depend on the ages or grade-level that the children were. For two young (6-8-year-old) children, we might keep them in the same level (FLL 1, for instance). What ages are you thinking about? Is there any other book/workbook I need to purchase alongside with this one? No, you don’t need any other book or workbook for Level 1 of the curriculum. I have a five year old step child. Which level is appropriate for her? How many levels are there? There are four levels altogether. We recommend that most students begin in first grade (approximately age 6). They should be comfortable reading sentences without too much help before they begin this program. I am about to start home educating my 6 year old and 8 year old. Should I start them both on level one; or level one for the 6 year old and level two for the 8 year old? Hi! You should start them both on Level 1. Is this a consumable workbook style program or nonconsumable? If nonconsumable are there workbooks I could purchase that go with the program? The first 2 levels don’t require any consumable materials. A lot of the work is done orally, and the rest is done on your own paper. So this textbook can be re-used year after year for multiple students. Hello, we are homeschooling our 4 sons. I started this program (Level 1) with my 2nd grader who was really struggling a few years ago. He has progressed beautifully! Now that we have found curriculums that are really working for us, I sat down to map out our homeschool plan over Christmas Break. While I was breaking down when to start each of the programs we will use, I noticed a discrepancy. In First Language Lessons Level 1 (page xiv) you say to use this program for First Grade. However, your website lists Level 1 for Kindergarten. Which is correct? Thanks for these wonderful programs. Also, our boys think it’s really cool that you taught at the same place their Gran teaches, William and Mary! Thanks for your kind message! We apologize for any confusion. Some people have used First Language Lessons Level 1 as young as Kindergarten, but most people find that it is better to wait until first grade. The child should be able to read complete sentences comfortably before beginning the program. How many lessons would you try to complete each week? months off in the summer before continuing to the next level. Reviewing one lesson per week over the summer will prevent the child’s forgetting the newly learned concepts. The discription says for Kindergarten, is that accurate? Or is level 1 actually Grade 1? It varies with the child…you could begin this program, at a slow/easy pace, as early as kindergarten, but most families begin in first grade. 5 out of 5 Which one do I have? I understand originally it was published with both levels together, how do I know which version I currently have? We enjoy the short lessons and the poems chosen are adorable l.
If you have a book with a cover photo of a little boy looking at a butterfly in a flower-pot, then you have the original edition with Levels 1 and 2 together. Is there a way to see sample pages? Is an previous phonogram/reading knowledge necessary for this program? Is there an assessment to determine which level your child is ready for? Wendy, there isn’t an assessment, but for First Language Lessons, for most students, we recommend starting at the child’s grade level. So a 1st-grader, for instance, could start with level 1, and a 3rd-grader could start with level 3. Concepts from previous years are thoroughly reviewed before moving on to new concepts. I hope that’s helpful. If you have a more detailed question, the folks at [email protected] can help you. Thanks! These lessons are quick and easy but very comprehensive. I feel that this provides the perfect foundation for early writing. For the 2nd graders, it would be best to start at Level 1. For the 4th graders, they can start at 3 or 4, depending on how much grammar they’ve had before. Start them with 3, and you can always speed up or skip ahead if they have already mastered a given concept. Regarding the above question…my younger ones are only 3 and 5, but I thought maybe waiting to start with FLL1 when the youngest is 6 and older is 8 (1st and 3rd grades). Any problems with holding the older child back? And, the layout of the lessons seem appropriate for one on one interaction and wondered how it might work having two children together, or is it not recommended. That’s a good plan and should work (assuming your kids are OK doing the same subject together). Doing FLL 1 with two children at once is fine, as long as both kids seem to be understanding the material and mastering the skills.